A new ad campaign on this year’s New Forest Tour to remind drivers to look out for animals on roads in the north of the Forest is sure to catch people’s attention. Last year there were 46 road traffic accidents involving commoners’ animals on the B3078 and B3079. These busy roads across the north of the New Forest bucked the overall trend of fewer accidents. Nigel Matthews, Community and Visitor Services Manager at the New Forest National Park Authority, said: ‘This year has got off to a good start. The number of animal accidents across the Open Forest by the end of June was only 40, compared to 64 in the same period last year. 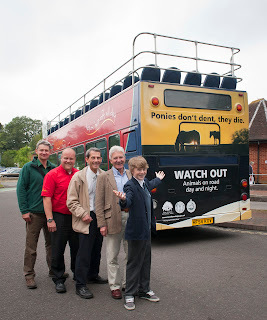 The New Forest Tour is the perfect way to promote safe driving around the Forest. Not only is it seen by thousands of people but one of its main purposes is to reduce traffic on New Forest roads. This specially-branded New Forest Tour bus is on the new red route which travels through Sandy Balls Holiday Centre at Godshill, Ashurst, Lyndhurst, Burley, Ringwood, and for the first time through the centre of Fordingbridge until 16 September.